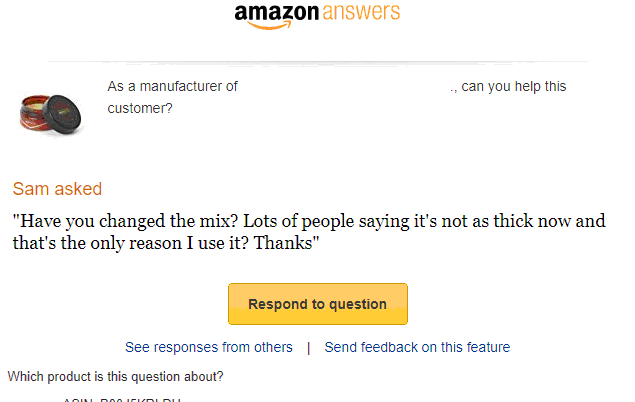 Amazon Vendors: Do you monitor Q & A on your product detail page? Content on Amazon pages is very important because any part of the content is indexed on search. Brand spends quite a lot of resources on creating a great content that helps to sell their product. Questions and answers are one the most important part of the content because it includes content that is important to the buyers. As a vendor, you may have already seen questions as shown screenshot below from customers and it is a good practice to get them replied within a reasonable time. One obvious reason is that it directly impacts sales and second reason is that you’d want a right answer to be included on this page. If you don’t answer it this question can be answered by the third party seller. So, when you see a similar email like below, simply follow link “respond” and as shown on second screenshot answer your customer.